A sunny spot that is easily accessed for cutting. Seedlings tolerate light frosts. Established plants may rebloom in late fall if protected from damaging hard freezes. Peas, Carrot, Cucumber, Tomato and Asparagus. Spring salad vegetables. Plant the curled seeds in your garden from early spring onward, or start them indoors and set out the sturdy seedlings. 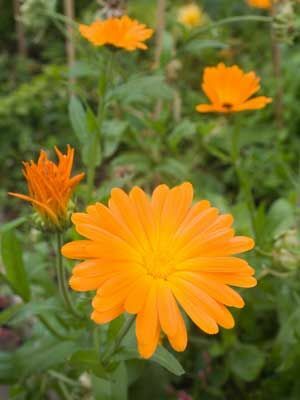 Allow some plants to produce mature seeds to scatter where you want to see calendula seedlings in subsequent seasons. Calendula blossoms are edible and can be used to bring orange color to rice or potato dishes, or snip them onto soups or salads for extra flavor and nutrition. Use clean scissors to snip off petal tips, and compost the rest. Cut flowers as soon as they fully open, preferably in late morning, and promptly dry them. Calendulas make marginal cut flowers because they partially close at night. For medicinal use harvest and dry entire calendula flowers. Infuse them in vegetable oil to make a medicinal oil with a long history of use for healing burned or abraded skin. Elderly plants suffer from powdery mildew and other fungal ailments. It’s best to send them to the compost pile and grow fresh replacement plants in a new place.